Asbestos-containing floor tile and also sheet flooring or resilient flooring product identification for white brick sheet flooring, red brick sheet flooring and similar patterns such as Bradford Brick, Romford Brick, Glenmore Brick. This article describes floor tiles and also sheet flooring, both asbestos-free sheet flooring and sheet flooring products known to contain significant levels of asbestos produced in a white red or golden brick pattern between the 1960's to the late 1980's. We also include photographs for identification of known asbestos-containing resilient sheet flooring as well as unknown flooring submitted for identification. The article gives safety and asbestos testing advice for sheet flooring products. This article gives advice for people worried about whether or not sheet flooring in their home contains or contained harmful asbestos. We include photos and descriptions of the most-popular brick pattern sheet flooring products to help in identifying this material. Several readers report asbestos test lab results confirmed asbestos in several popular brick-pattern sheet flooring installed in North America as well as some other areas before the mid 1980's. 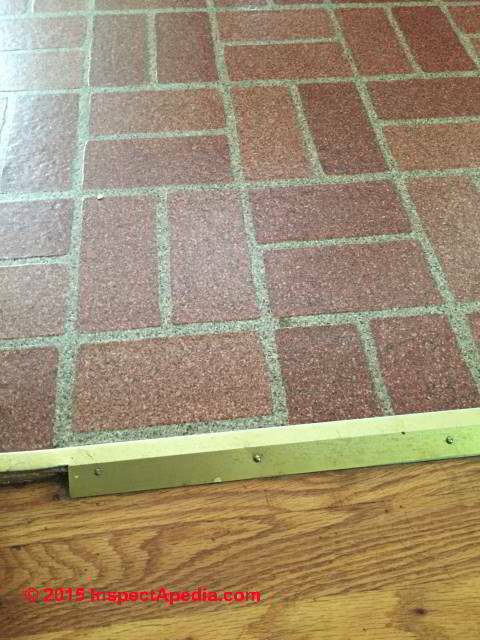 Watch out: red brick sheet flooring including varied-square-sized flooring like the Armstrong pattern shown here (probably Armsrtrong #5352 "Linoleum") has been found to contain asbestos. Adding confusion, some reader's tests of identical-looking flooring (reported later in this article) found no asbestos in their sample. Bottom line: treat the sheet flooring shown here as PACM - Presumed Asbestos Containing Material - or have a sample of your specific floor tested for asbestos. That does not mean that occupants of a building where such flooring was installed is in grave danger from airborne asbestos from the flooring. Where the floor is not glued down, asbestos or not, it can be removed easily with no significant asbestos hazard. Where it's glued down, sheet flooring removal needs to consider minimizing dust and cleaning up properly afterwards. Note too that some floor mastic adhesives also contained asbestos. When the asbestos-suspect flooring has already been removed but where you are worried about asbestos dust, you can test settled dust or you can simply do more cleaning: damp wiping and HEPA vacuuming. Below: a reader-supplied Asbestos Test Report for a 1970 home. 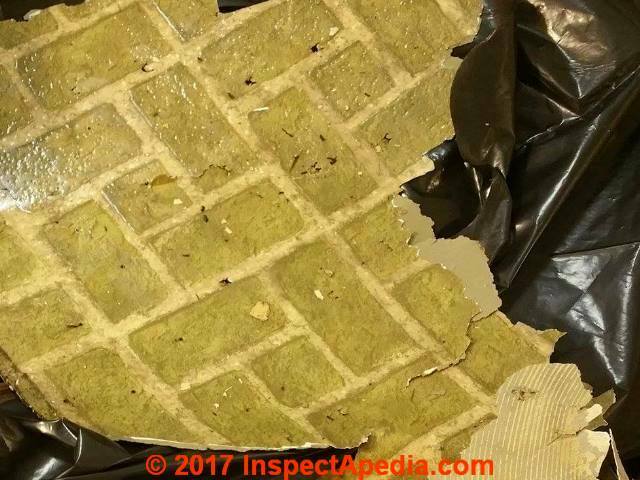 Their Armstrong red brick sheet flooring varied-square-sized flooring shown below along with the report was confirmed as containing Chrysotile form asbestos. provides a general guide to collecting settled dust to send to a qualified laboratory for analysis. You'll want to know if significant levels of asbestos or other potentially harmful particles are found in the sample. This approach, while not giving a quantitative "number" in in fact a more-reliable way to assess a remaining asbestos-dust hazard than an "air test" whose variability error can be several orders of magnitude. 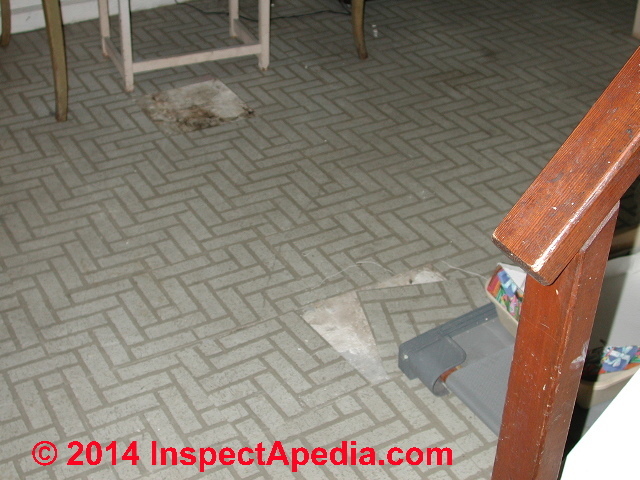 Reader Question: does this red brick linoleum sheet flooring contain asbestos? We recently purchased a house that was built in 1900 and decided to rip the carpet up because underneath was hardwoods which is what is in the rest of the house. After we ripped it up we noticed what looks like old linoleum backing and glue which we have tried to scrape up and did not think about the risk of asbestos. Around the very edges of the room there was still 2 inch strips of the old linoleum and I have tried to find the style in the reference pictures you have and I haven't seen any like it so I have attached a picture that is almost identical to what we have to see if you know if contains asbestos or not. The damage is already done as I have scraped all the glue and old backing up but I am very concerned as it is my daughters bedroom. Here is a picture of the flooring I have in questions about weather it has asbestos in it or not. I couldn't find a picture of it on your site but I did find a lot of other helpful information. I think that the sheet flooring in your photos is probably Congoleum's "Red Brick" vinyl sheet flooring pattern. Some web articles we reviewed called this material "linoleum" and although I think that word is often used too loosely to simply mean "sheet flooring" the product names are confusing. For example some Armstrong sheet vinyl floor coverings were labeled as "linoleum". If the flooring has what looks like burlap - a jute backing - on its reverse it's probably very old and not an asbestos-containing product. If it has a smooth, non-fabric backing it may contain asbestos and should be treated as PACM - presumed asbestos containing material. From your photo (above left) this looks like a very-widely used sheet flooring with an impregnated asphalt felt backer - let me know. Some such felt backers included asbestos. 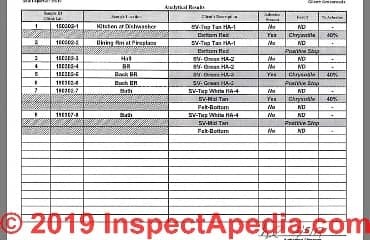 As we report below, a reader obtained an asbestos test lab report on a sample of flooring that looks like that above: the lab did not report finding asbestos in that sample. Watch out that the mastic used to adhere old sheet flooring may also contain asbestos. After trying various solvents on a black mastic years ago I discovered that it was water soluble and came up easily once I let it sit wet for a few hours. Try that. If you are facing a large cost or have other reasons to be concerned about asbestos contamination in the building it would not be costly to have a small sample of the floor tested. At the end of this article we include links to information on how to minimize the asbestos hazard from asbestos-suspect sheet flooring or tile flooring. It had almost a felt type black backing that is what was still stuck to the floor that I had to scrape and it did get soggy mushy in warm water. Scraped up fairly easy and the glue I was able to mop up with several times of mopping over the entire floor. Just wanted to see if that is the burlap type backing you were possibly talking about. Watch out: No the backing you describe is not a jute backer; rather it sounds like an asphalt impregnated felt type backer - some of which contained asbestos; wetting and mopping make some sense in that case. We are concerned about asbestos in our kitchen sheet flooring. We are 99% sure it is the original floor--as there is nothing underneath it. The Home was built 1973, and we are pretty sure it was Forest City Enterprises who built it (if that helps?). I carefully wet-scraped up a small piece. 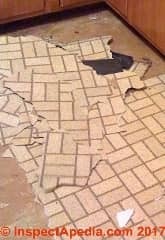 It was fairly stubborn if you scraped the bottom part or did not go 'under' the tile fully --almost like sand, but if you scraped below the sheet, it came up easier. I believe it is an embossed sheet vinyl (has recessed grout lines) the bright orange paint on the edges is what I used to seal any potential dust. Given the date of the floor installation (1973) and pattern you should have treated the flooring as presumed to contain asbestos. It would not perhaps be necessary nor appropriate to test something that is easily rolled up and disposed-of, but you'd have wanted to avoid creating a dusty mess. Craftlon Romford Brick 9" x 9" x 3/32" vinyl asbestos floor tiles were available in White 57020 and in Red 57021 - shown at above left. Gold patterns appeared later. see ASBESTOS TESTING LAB LIST for help in finding a certified asbestos test lab. Typically the asbestos test lab fee is around $50. U.S.
Asbestos is found in older floor tile mastic adhesives, particularly the older black asphalt mastics often contained asbestos, as did other similar mastics used in roofing and flashing cements. Asbestos is found in some (not all) sheet flooring backing materials as well. It is possible that this popular vinyl asbestos pattern originated in the early 70's as Armstrong's "Romford Red" which is itself an interesting name as I suspect the name leaked over from Rumford - the colonial Tory who fled the colonies back to Britain during the American Revolution. Rumford was sent to Bavaria where he developed the measurements on the perfect fireplace design - a specification that many red brick fireplaces as of course other fireplaces later followed. A less likely origin of the name is from Romford in Northeast London. Shown here, a torn-up white Romford Brick-like floor pattern in sheet flooring form. Brick pattern tile and sheet flooring that look like this were produced at least by Armstrong (under several pattern names I give below) and by Kentile Ken-Flex Flooring. If your building contains this white brick (or red or green brick) pattern in a floor that was installed before the mid 1980's it would be prudent to treat the floor as PACM or "Presumed Asbestos Containing Material" - not something to panic about, but take care not to make an unnecessary dusty mess. See ASBESTOS FLOORING HAZARD REDUCTION for detailed guidance. Based on what I saw when I removed the flooring, which I believe was old asbestos backing, I'm hoping what I removed was a newer version. - Anon. Below we report on another reader's asbestos test result for this floor pattern. Above, another white brick and half-brick sheet flooring product that may contain asbestos. 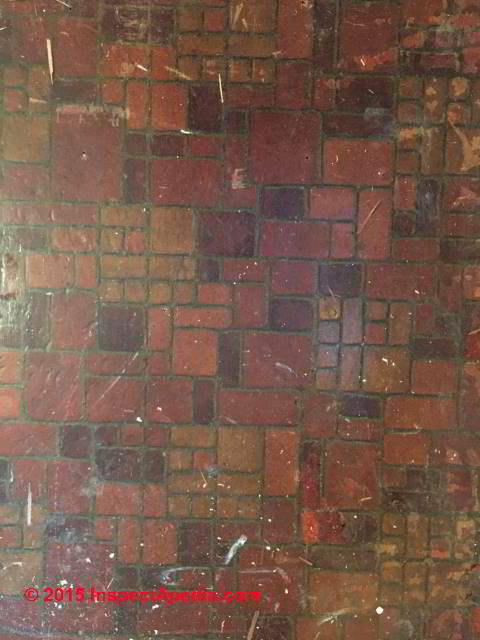 Below: an Armstrong White Romford-brick floor tile pattern sent to us from a reader whose home was built in 1968. From the age of the home and the appearance of this white brick pattern flooring it would be reasonable to assume that this floor tile contains asbestos. Notice (from my next illustration) that this floor pattern was also sold as 12x12 floor tiles. 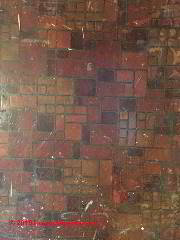 Here are more examples of widely-sold Armstrong vinyl-asbestos floor tiles in brick patterns. Brick pattern tile flooring was sold in both 9x9" and 12x12" versions. 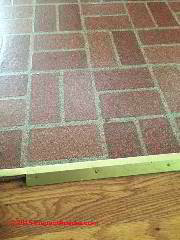 Don't confuse this with Armstrong CUSTOM GLENMORE BRICK 12" x 12" x 1/16"
Below: Custom Old Forge, another brick floor tile pattern in 12x12" format followed by yet another 12x12 brick pattern, Armstrong Country Brick. Similarly, note this White Romford Brick sheet flooring pattern (below, Armstrong but not a Solarian product) was sold also as vinyl-asbestos floor tile. Armstrong CUSTOM GLENMORE BRICK 12" x 12" and CUSTOM OLD FORGE 12" x 12" x 1/16" thick floor tiles, are shown in our first photograph below. Feel free to add that red brick sheet vinyl to the list of 'known' asbestos. Thanks R.D. 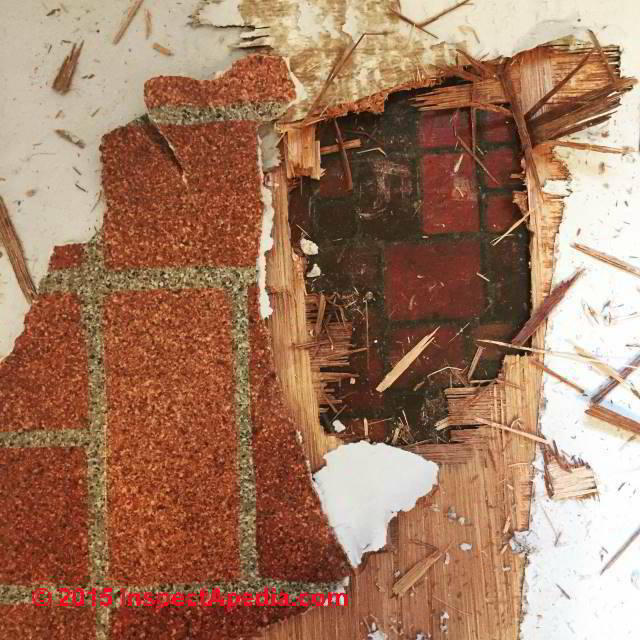 You can see more brick pattern asbestos floor coverings that contained asbestos in a tile form that is very similar to the red brick sheet flooring in your photos. Both were very popular. 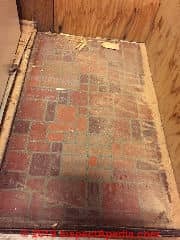 See ARMSTRONG FLOOR TILE IDENTIFICATION 1974-1979 for more images of brick pattern asbestos containing flooring like the white brick Armstrong flooring shown at above-left. Don't confuse this with CUSTOM GLENMORE BRICK 12" x 12" x 1/16" and also distinguish it from or ROMFORD BRICK floor tiles from (example year) 1973. Also see our BRICK FLOOR PATTERN PHOTOS from 1978 where we show both tile and a continuous sheet resilient flooring product that also used the Romford Brick floor pattern. Thanks C.B. - if you can send along a copy of the asbestos test lab report it would be good for us to have that on file, protecting your anonymity but also supporting any future questions about this report - Ed. We did not find our particular style of Armstrong vinyl sheet flooring on your website and therefore are submitting our photos and information in hopes that you are familiar with the style and know whether or not it contains asbestos. From our research, we determined that the Armstrong vinyl flooring brick pattern first appeared in the 1970s but continues through today. 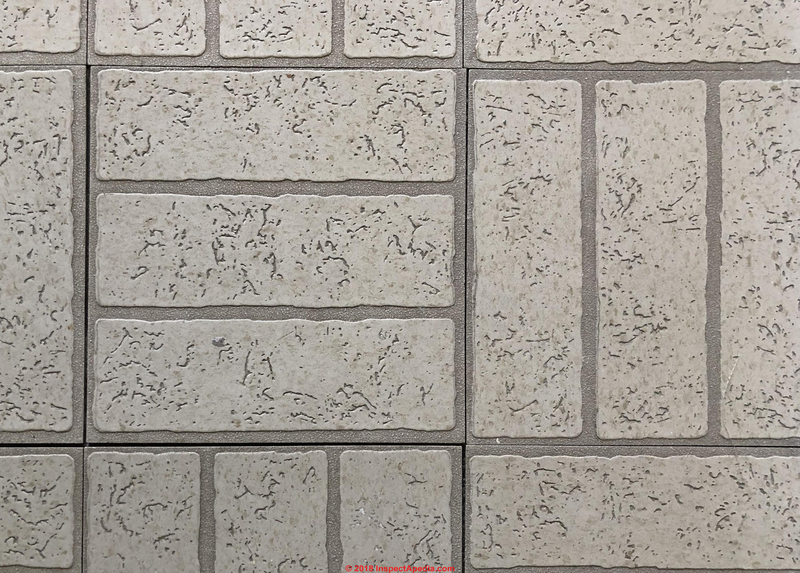 The style appears to be most closely related to the Bradford Brick vinyl tile pattern, but the coloring is more varied and it comes in sheet flooring with white paper backing. The first few pictures are our own (installed kitchen flooring, view of hardwoods and kitchen threshold to flooring, and backing on extra sheeting roll in basement - with no labels or information unfortunately) and the last photo we found online - it confirms that Armstrong was the manufacturer (logo on demo photo). Our home was built in the 1950s, but the floor was clearly installed at a later date as it is not continuous under the original cabinets and the original hardwood floors can be seen continuing from our living room under the vinyl sheet which is glued to plywood on the hardwood floor (note the height difference and threshold in the kitchen flooring photo). Any help would be greatly appreciated! We would really love to pull this floor up ourselves and refinish the hardwood underneath! Indeed because this has been such a very long and popular floor pattern in both tile and sheet flooring forms it's difficult to guess reliably about its asbestos content unless we have reason to think that the floor was installed before the mid 1980's. Some readers have had later flooring tested for asbestos and have confirmed that later, that is newer flooring did not contain asbestos. If you think the floor is that old or older it's reasonable to treat it as presumed to contain asbestos. IF you are faced with a requirement for demolition and if you are uncertain about the flooring's asbestos content and cannot identify it through our guides, then you have a sample tested. At the end of this article we give a link to help with finding an asbestos test lab. I previously spoke with the woman who owned our home from 1987 - 2001 and she claims to have installed the vinyl sheet flooring (along with our green formica countertops - the good 'ol days :), however, I do not know when the product was manufactured. ... we had our floor tested by an accredited lab and confirmed that it did NOT contain asbestos and the glue was modern and safe. However! When we removed the layer of vinyl over plywood, and pulled back a section of the plywood, we discovered yet another layer of hidden vinyl sheet flooring glued to our original hardwoods (pictures attached) this appears to be an older model and the company is currently unknown to us. The owner of that floor did not have a sample tested so your test results will be important. Other readers' tests of your second flooring example (below) are given higher on this same web page and have confirmed the presence of chrysotile asbestos. Good news! There was not any asbestos in the vinyl sheet flooring, black felt backing, or mastic. Continue reading at RESILIENT SHEET FLOORING ID GUIDE or select a topic from closely-related articles below, or see our complete INDEX to RELATED ARTICLES below. This article DUST / MOLD TEST KIT INSTRUCTIONS gives details on how to collect a dust sample using clear adhesive tape: low cost and easy. This article ASBESTOS FLOOR TILE LAB PROCEDURES - gives bit of background on how a lab might test actual flooring samples.